With encouragement from the National Science Foundation’s (NSF) Directorate for Computer Science and Engineering (CISE), the Computing Community Consortium (CCC) proposed to develop and administer a short-term program that would provide postdoctoral positions for about 60 Ph.D.s – called Computing Innovation Fellows, or CIFellows – for one to two years. 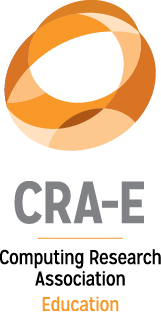 CERP evaluated the CCC Early Career Researcher Symposium held in Washington, D.C. during August 2018. Evaluation findings showed that participants of the symposium gained potential collaborators for future work. These findings highlight a key feature of the symposium, which was to encourage networking and discussions among peers and leaders from the field. The Computing Innovation Fellows (CI Fellows) project, was a program that granted short-term postdoctoral fellowships to help keep recent graduates in the field during the economic downturn. Between 2009 and 2011, 127 PhD graduates in computer science and related fields were awarded CI Fellowships. The program has ended and the former CI Fellows are now in the early years of their formal careers. 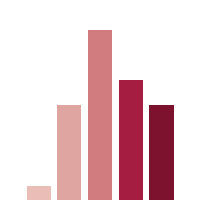 Applicants who applied to the Computing Innovation (CI) Fellowship Program in 2009, 2010, or 2011 were recruited during the fall of 2013 to complete CERP’s survey of postdoc experiences. We asked a sample of CI Fellows (n = 66) and non-fellows who had other postdoc experiences (i.e., Non-fellow Postdocs; n = 117) to reflect on their career aspirations upon completing their PhD and their career aspirations upon completing their postdoc. Both groups reported the same level of interest in pursuing a tenure track academic career upon PhD completion. 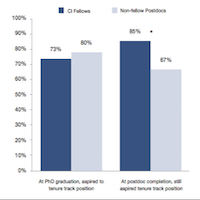 Among those who had aspired to a tenure track position at upon completing their PhD, CI Fellows reported greater aspirations for being a tenure track academic after completing their postdoc relative to Non-fellow Postdocs, p < .05. These findings suggest that the CI Fellows postdoc program helped individuals maintain interest in a tenure track academic career. 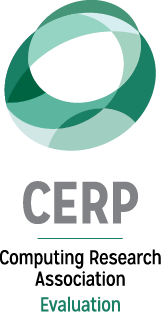 Applicants who had applied to the Computing Innovation (CI) Fellowship Program in 2009, 2010, or 2011 were recruited during the fall of 2013 to complete CERP’s survey of postdoc experiences. We compared the responses and outcomes of CI Fellows (n = 66) to non-fellows who had other postdoc experiences (i.e., Non-fellow Postdocs; n = 124). CI Fellows reported higher salaries than Non-fellow Postdocs for academic research postdocs, but lower salaries than Non-fellow Postdocs for industry research postdocs, ps < .01. 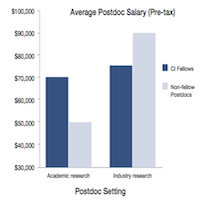 In academic settings, CI Fellows found it easier to live on their postdoc salary and were more satisfied with their pay than Non-fellow Postdocs, ps < .01. In industry settings, there were no group differences in perceived adequacy of pay. Last month, Google announced the recipients of its Summer 2013 Research Awards, and two former Computing Innovation Fellows (CIFellows) were among the winners: Mohit Tiwari and Katrina Ligget. These awards are made to researchers in computer science which cover tuition for graduate students and provide the opportunity to work with Google scientists and engineers. Tiwari was a 2011 – 2013 CIFellow at the University of California, Berkeley. He is now an Assistant Professor at University of Texas at Austin. He discusses his path as a CIFellow and his Google Research Award below. 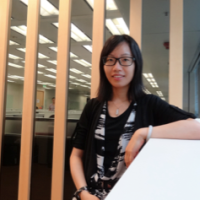 During the economic downturn in 2009, Xiaojuan Ma was one of the many new PhDs in computing who considered delaying or abandoning a research career because of insufficient funding. 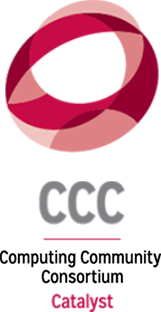 From 2009- 12, the Computing Community Consortium (CCC) developed and administered the Computing Innovation Fellows (CIFellows) project, a short-term initiative that addressed this problem by providing funding for 127 postdoctoral positions throughout academia and industry. In early 2009, the Computing Community Consortium (CCC), with the support of the National Science Foundation (NSF), launched the Computing Innovation Fellows Project, a short-term initiative providing recent Ph.D.s with one- to two-year postdoctoral positions at academic institutions and industrial organizations with fundamental computing research and education programs. Three years later, we have developed a new website: https://cra.org/ccc/cifellows to establish a permanent record for the program. Entering the workforce following the support and protection of graduate school can be challenging. These challenges were compounded by a difficult economy with limited prospects for research and academic positions in 2009. Nearly 80 Computing Innovation Fellows (http://cifellows.org) descended on Washing-ton, DC, in mid-December for the 2010 CIFellows Project Research Meeting and Career Mentoring Workshop (http://cifellows.org/network/agenda). 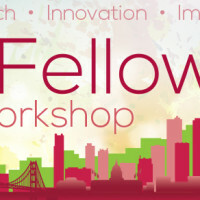 Funded by the National Science Foundation and run by the Computing Research Association and Computing Community Con-sortium, this meeting provided the 2009 and 2010 CIFellows with opportunities to network with one another and to receive career advice from leading experts in the field. For a second straight year, this summer the Computing Research Association, with fund-ing from the National Science Foundation, extended offers of one- to two-year postdoctoral fel-lowships to new Ph.D.s, in an attempt to retain recent graduates in computing research and teaching during difficult economic times (see 1,2 for details). A key requirement of the CIFellows Project has been to support intellectual diversity in computing fields at U.S. organizations.